In a photo obtained in an open records request by Truthout, the Colorado-based oil and gas company Vantage Energy’s subcontracted oil and gas workers with Houston-based Weatherford International can be seen openly mocking a nonviolent civil disobedience action taken by anti-hydraulic fracturing (fracking) activists in June who were defending the former democratically passed fracking ban in the Texas town of Denton. At least three out of 10 anti-fracking activists who were arrested in Denton in June also posed with that very same sign, but they weren’t smiling at the time. Rather, they sat soberly in front of it, determined to delay scheduled fracking operations at a Vantage Energy gas well site on the edge of the city’s west side by blocking the entrance to the site. Now, local residents are again mobilizing to fight renewed fracking in the city limits of Denton and on the city’s outskirts as anti-fracking activists across the state work to form a statewide coalition to restore local control to regulate fracking in their own communities – including the right to ban the extraction process. Denton’s City Council repealed the fracking ban ordinance in June under pressure from impending lawsuits, which have since been dismissed, and the Texas Legislature’s early May passage of House Bill 40 (HB 40), a law rendering Denton’s fracking ban unenforceable and preempting more than 300 Texas cities’ ability to regulate the oil and gas industry within their limits. The bill, commonly known as the “Denton Fracking Bill,” was written directly in response to Denton’s citizen initiative banning fracking. Blackland Prairie Rising Tide activists, as part of the larger Flood the System fall mobilization effort that is working to build toward a series of coordinated mass direct actions in November, are again training Denton residents to take action to delay, and possibly halt, fracking operations at gas well sites where Vantage Energy plans to frack within Denton city limits starting this month. Activists with Frack Free Denton are also organizing in opposition to a two proposed natural gas power plants, pushing city leaders to emulate the Texas city of Georgetown, which recently announced it would purchase its electricity entirely from renewable sources starting next year. Vantage has already renewed fracking operations at three gas wells located in the same area where residents were arrested in June along Denton’s western city limit. Eight other preexisting gas wells already besiege the 80-home Spring Hill Estates neighborhood across from the site, which previously experienced impacts to the community’s shared well water in the summer of 2014 when Vantage Energy fracked several wells there. The homes are not technically within Denton’s city limits, even though the wells are. The Spring Hill Estates neighborhood is technically under the jurisdiction of Denton County, although most school-age children in the community attend schools in the city of Krum, and residents consider themselves Krumites. Sheila Achuff, a Spring Hill Estates resident, started up a small anti-fracking educational group, Frack Free Krum, after networking with Frack Free Denton activists who worked to bring attention to the Nail Road-area fracking in June. So far, she says, about 50 people have supported the organization, although she has experienced a lot of pushback from Krum residents who support the oil and gas industry. For residents like Achuff and many anti-fracking activists in Denton, the photo of the contracted oil and gas workers at the Vantage Energy site represents more than just a bit of fun with a sign. It symbolizes an industry that has yet to take their efforts seriously – even as pushback from that industry and state lawmakers has galvanized more cities to fight to restore local control over fracking operations. Across the state, anti-fracking activists are banding together in a loose coalition called the Texas Grassroots Network to monitor fracking operations in cities throughout Texas, and to recruit candidates who oppose HB 40 and support the rights of communities to regulate fracking operations locally. The coalition, which consists of residents of Arlington, Mansfield, Fort Worth, Denton, Flower Mound, Southlake, Laredo and many other Texas cities, has met in Austin and Arlington to begin forming its goals and strategies. According to Frack Free Denton activists, the group is still working to finalize the language of a draft resolution in support of local control that they hope city representatives across the state will sign. A recent poll conducted by the University of Texas showed a majority of Texans support local control, believing cities should be able to ban and regulate fracking even after the passage of HB 40. HB 40 not only banned fracking bans in Texas, but also eviscerated more than 100 years of the state’s proudly held tradition of local control, known as “home rule authority,” by preempting cities’ ability to effectively regulate oil and gas industry operations. The new law is part of a wider American Legislative Exchange Council (ALEC)-backed strategy emerging in Republican-dominated state legislatures this year, aimed at curtailing municipalities’ regulatory authority at the behest of industry. According to the records obtained by Truthout, Eric Burkhalter, who is a drilling and completions manager with Vantage Energy in Texas, emailed the photo of the workers with the sign to Denton Police Sgt. Scott Jenkins on June 12. Jenkins then forwarded the message on to city employees, where it was obtained in a batch of responsive records to Truthout’s information request. Jenkins told Truthout he spoke briefly with Burkhalter one morning at the gas well site last June while anticipating a demonstration from Denton residents. Jenkins says he asked Burkhalter what happened to the sign the protesters left at the entrance, and Burkhalter told him the sign “was still in their possession and that some contractors took a photo while posing with the sign,” according to Jenkins. Truthout pursued responses from Burkhalter and Vantage Energy’s Texas media relations representative Nancy Farrar, as well as media relations representatives from Vantage Energy’s subcontractor, Weatherford International, via email and repeated phone calls, but did not receive a response to inquiries about the context of the photo and the conduct of the workers depicted in it. It remains unclear who took the photo. The emails obtained by Truthout also confirmed that the Denton Police Department actively monitored the social media activity of Blackland Prairie Rising Tide, whose activists are associated with the larger Frack Free Denton movement. The Denton Police Department worked to warn Vantage Energy operators ahead of time of planned actions at the gas well site located across from Nail Road along the city’s western limit, according to emails obtained by Truthout. Presidential candidate Dr. Jill Stein, who Truthout has interviewed previously, reacted to the photo of oil and gas workers seemingly mocking Denton anti-fracking activists, saying the photo was unfortunate, given the increased risks to health and safety that oil and gas workers also face from the industry. Stein cited studies that show that oil and gas workers were killed on the job at a fatality rate that is nearly seven times greater than the rate for all other US industries, and other studies that show oil and gas workers are exposed to greater levels of carcinogens like benzene. Stein is currently making a campaign swing through Texas, touring gas well sites across the state and meeting with anti-fracking and environmental activists concerned about the loss of local control. Stein also visited the US Immigration and Customs Enforcement’s Karnes County Residential Center, a jail for undocumented immigrant families operated by the private prison company GEO Group, to address concerns about the Obama administration’s use of indefinite detention in conditions many advocates have compared to internment camps. Karnes County sits on the Eagle Ford shale, and is one of the most heavily fracked counties in the state. Stein also toured well sites in Karnes City in addition to the immigrant family jail there. Stein joined a panel at the First Jefferson Unitarian Universalist Church in Fort Worth in mid-October after touring three well sites in Arlington, Texas, including a site, where, in April, more than 100 residents were evacuated from their homes after fracking fluid spilled out of the site onto city streets. It took Vantage Energy operators nearly two hours to call 911 after the blowout occurred, according to Arlington officials, who blamed the company for its “unacceptable behavior” and fined it $84,000. Stein lauded Liveable Arlington members for organizing to educate their communities about the effects of gas drilling, linking fracking to extreme weather and the impacts of global climate disruption. She also spoke about the need for Texans to fight back against laws like HB 40 to restore local control over fracking regulations in their own communities. “What Arlington is doing, much like what Denton organized to do, to stand up and say ‘no,’ and to stand up and defend our future, is important,” Stein said. “They pushed back against Denton, as we know, but Arlington’s going to be close behind, and we have the progress that was made in Dallas … So it’s important for us to not be bullied and goaded into thinking that we’re powerless,” Stein said. These children live with fracking at home, and will go to school with fracking during the day. Stein was arrested in 2012 when she resupplied activists who occupied trees in the path of the southern leg of the Keystone XL pipeline in Winnsboro, Texas. Stein remains “vehemently” opposed to the pipeline, which would double the amount of tar sands from Alberta, Canada, that is already being brought to refineries in Houston and Port Arthur, Texas, via the original Keystone 1 pipeline system. Stein is also opposed to lifting the federal ban on crude oil exports. The US House of Representatives passed a bill to lift the ban in early October, which Stein called a bad move for both the economy and the environment, linking the push to lift the export ban to the expansion of liquefied natural gas (LNG) terminals in the United States. The main planks of Stein’s presidential platform include a “Green New Deal,” which she hopes would create millions of jobs by transitioning the country to 100 percent renewable energy by 2030. The Green New Deal also involves investing heavily in public transit and sustainable agriculture. She promises to also initiate a global treaty to reverse climate change and end extreme forms of extraction, like fracking. During the panel conversation with Stein on October 16, Achuff, who lives in the Spring Hill Estates neighborhood, told her family’s story and highlighted the plight of her neighbors and especially their children – who can find no refuge from fracking. Spring Hill Estates residents told Truthout they hadn’t received any notice by mail from Vantage Energy that the company would begin fracking the three wells on October 2. Furthermore, residents have encountered confusion due to a misprinted sign provided by Vantage Energy that displayed the wrong public notice telephone number. The 1-800 number listed connects to an automated telemarketing service that promises free cruises in exchange for responses to a survey. Try calling the number listed on this sign provided by Vantage Energy as public notice for residents living adjacent to three gas wells undergoing fracking. You will be offered a free cruise. 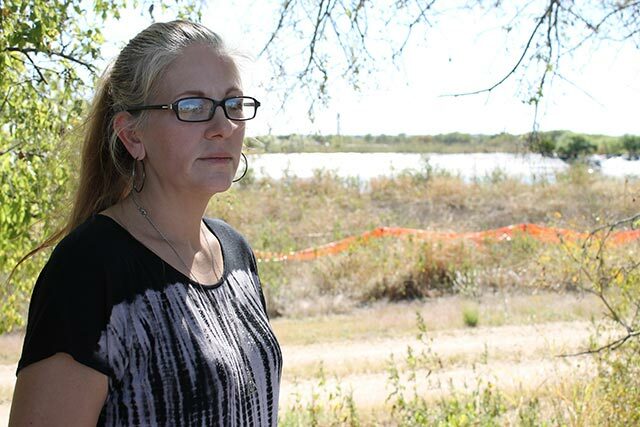 (Photo: Elida Tamez)Achuff explained her worries about the proximity of a produced water storage tank behind her house because such tanks have exploded in Denton and elsewhere before – and about the fact that a child under her custody recently experienced her first nosebleed. Achuff’s concerns about how Vantage operates aren’t unfounded: After lightning struck near another Vantage Energy gas well in the middle of a residential neighborhood in Denton in May, the well burned for several hours before a subcontractor was able to shut off the flow of gas. Pennsylvania’s Department of Environmental Protection imposed a nearly $1 million fine on Vantage Energy in 2014 – one of the largest fines meted out to an oil and gas company – over several regulation violations. Achuff also believes her grandson’s premature birth is linked to the fact that her daughter-in-law lived with her, in close proximity to the gas wells, throughout her pregnancy. She cites a recent study out of Johns Hopkins University, which links exposure to fracking wells with premature births. Children who live in the Spring Hill Estates neighborhood also attend several schools that are all located in close proximity to a gas well preparing for impending fracking. Krum High School, the Blanche Dodd Intermediate School and a local day care at Krum’s First United Methodist Church all sit only about 250 feet away from the well. Krum Middle School is located on the other side of the high school, only slightly farther, at about 500 feet away from the well. These children live with fracking at home, and will go to school with fracking during the day – and Achuff’s daughter is one of them. Because many of the gas wells located across from the Spring Hill Estates neighborhood and the well located adjacent to the local schools are considered technically outside the city limits of Krum, they fall into the extra-jurisdictional purview of Denton County. But residents have been unable to find a county-specific public notice phone number they can call in case of emergency, or for other information regarding the wells. Full disclosure: As a resident of Denton, Texas, for seven years, this reporter, at various times throughout the past six years, has participated in efforts in which residents have organized against fracking in Denton. She considers many Frack Free Denton activists personal friends. To read her personal account of the history of the city’s struggle to protect residents’ health and safety, see this story. The Denton Drilling Awareness Group plans to turn Denton into a frack-free city, making it the first in Texas to ban fracking outright.